After reading the Engadget article about DARPA speed testing the drone called ACTUV or Anti-Submarine Warfare Continuous Trail Unmanned Vessel and watching the video; with the swipe of a finger Google Now displays on the screen. 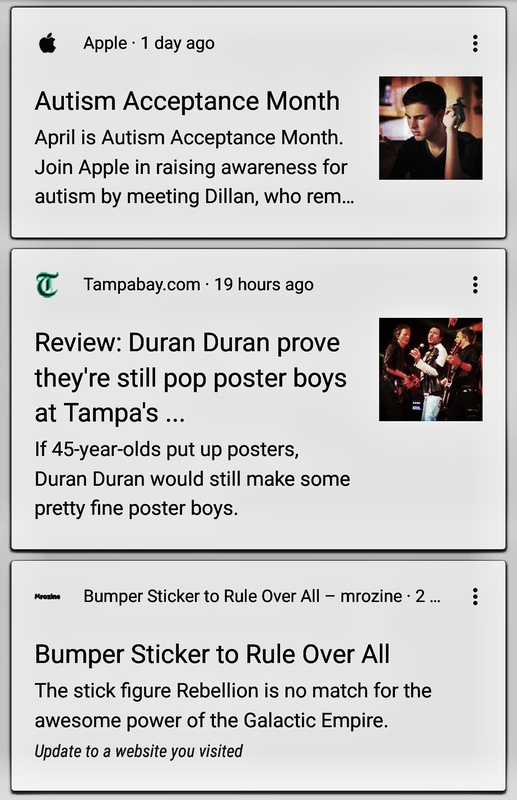 mrozine was there at the bottom of Google Now; right below the article about Duran Duran still existing. The fact that a mrozine post was inserted into Google Now because of a recent visit to the website is not lost. It is understood that this is not really a measure of success… unless thousands/millions of you were also having mrozine pushed to your Google Now; that would be something. There are absolutely zero statistics to point to anyone clicking through the site.